The aim of the game is to score points. These points are obtained by having their faction dice symbols showing in multiples of 6 ( where 6 pips represent 1 point ). Other symbols on the cards provide the player with additional abilities such as rethrows, trimming the opponents' deck, throwing additional cards, being able to count a card even if it doesn't touch any existing card. Players throw their cards one per turn ( unless your ability takes effect ) till each of their deck runs out. Points are scored each turn and at the end of the game the player with the most points is the winner. I initially bought the game to be a filler for when I have 5-6 players around. I wasn't expecting much from it and I think that's a good thing. Each game plays very quickly and the rules are very easily understood. My friends actually enjoyed it which is always a great thing. We played 3 games back-to-back and there was much laughter and idiocy going around. Just a simple act of throwing cards onto a table and doing it really poorly or luckily somehow brings out the worst and most embarrassing moments in people. During the game you can feel the competitive nature rise up in all the players even though we all know that the outcome is mostly luck based. Card throwing isn't a skill found in most people. At the end of the day, Maximum Throwdown is what you make out of it. If you're expecting a serious game for your friends then I guess you haven't been doing your research. It is purely a no-brainer ( nearly enough to be called stupid ) type of game where you take it out, and just have fun. Leave your brains at the door or in the box of your last played game. 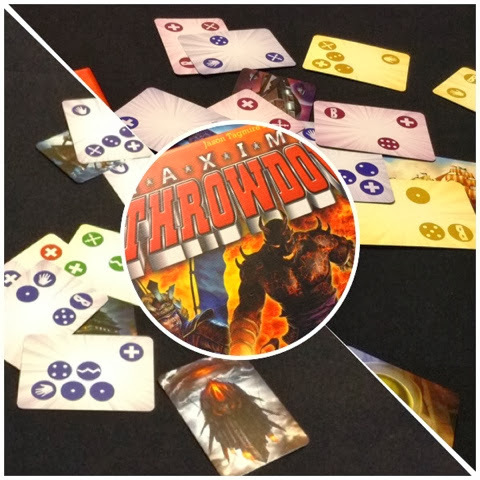 If you aren't into dexterity games Maximum Throwdown won't change your mind either. But I'll confidently say that you will be ok with a few plays of it as everyone else is going to be equally clumsy at the game as you think you are with most dexterity games. All that being said, I don't classify Maximum Throwdown as a good filler, it's hardly that. It's more of a toy than a game, and I will play it for entertainment, but as a game I think it falls short of what I was hoping for ( even if I didn't have much expectations for it ). Other Thoughts: this game REALLY needs a score pad. in-game tracking without one is a PAIN.